I realize I’m the crazy one. I’m the one with the hang-up. Cookie Dough Ice Cream is one of America’s top scoops, adored by young and old. Even my ice cream bible offers a recipe for it. Bloggers have made cookie dough chic with cookie dough cupcakes, cookie dough-topped brownies, and cookie dough truffles. I gawk at them; their construction is typically quite unique. I respect them. I get the candy-like appeal, but the feeling just isn’t mutual. That’s why, you will see, I was taken aback when I made these cookies. Despite my illustrated reverence for them, it has been maybe a year and a half since I have made a simple drop cookie. Feeling experimental, I replaced the ground and chopped hazelnuts in Joanne Chang’s (and Pastry Chef Nicole's) Milk Chocolate Hazelnut Cookies with almonds. Yes, I get that the original cookie is a play on Gianduja. While I enjoy the strong aroma and coffee-like notes of hazelnuts and appreciate Nutella, the almond is the nut that always calls to me. Frangipane tarts, Swedish almond cake, Danish kringles, almond macaroons: these are some of my favorite pastries to make and eat. 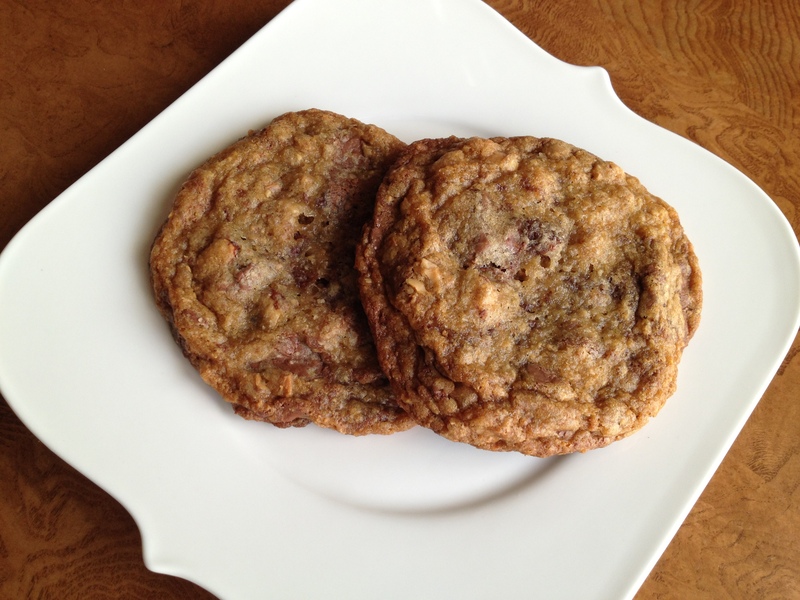 The use of almond two ways in these cookies is heavenly. But here’s the kicker: before the oven had even had the chance to properly preheat, I had eaten a whole cookie worth of dough after its overnight rest in the fridge (and these babies are big, about 2 ¼ ounces per dough ball)! The period of hydration made the dough so uniform, so caramely and subtly salty with the pleasant grit of the incorporated ground nuts. This was bound to be a good cookie. Slender, but relatively hefty, the now-titled, “Milk Chocolate Almond Cookies” once baked had chewy centers thanks to the addition of ground almonds to the flour mixture and crunchy, flavorful rims from the caramelization in the oven. Each bite featured a ribbon of smooth milk chocolate and the crunch of chopped almonds, their centers golden brown from proper toasting. The complex and perfumed almond flavor came from the nut being used as much more than a mix-in. Since its presence comes to the fore, the nut you use will define this cookie. I made small changes to the recipe, and they are reflected below, but I strongly encourage you to check out the original recipe that inspired it in the Flour Cookbook. Cookie dough that's brimming with different flavors and textures? That's a raw diet I could follow. 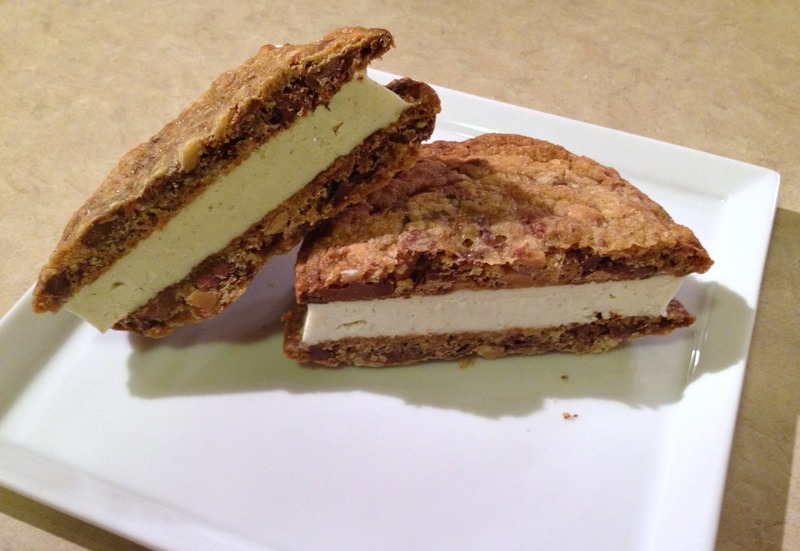 It makes a killer ice cream sandwich, too. Spread almonds out on a baking sheet. Toast for 8-10 minutes or until the nuts are fragrant and their centers are medium brown. Set aside to cool. In a food processor, pulse 1/2 cup (70 grams) of the cooled almonds until ground to a fine powder. (Stop grinding once they are powdery; if you continue, they will become a paste.) Set aside. Roughly chop the remaining 1 cup (140 grams) almonds and set aside. Using a stand mixer fitted with the paddle attachment (or a handheld mixer or a wooden spoon), cream together the butter, granulated sugar, and brown sugar on medium speed for about 5 minutes, or until the mixture is light and fluffy. (This step will take about 10 minutes if using a handheld mixer or a spoon.) Stop the mixture a few times and use a spatula to scrape the bottom and sides of the bowl and the paddle. Beat in eggs and vanilla on medium speed for 2 to 3 minutes, or until thoroughly incorporated. In a medium bowl, stir together the ground and chopped hazelnuts, the flour, baking soda, salt, and chocolate. On low speed (or with the wooden spoon), slowly blend the flour mixture into the butter-sugar mixture and then mix just until mixture is totally incorporated and the dough is evenly mixed. Scrape the dough into an airtight container and let it rest in the refrigerator overnight (at least) before baking. When you are ready to bake, position a rack in the center of the oven and heat to 350 degrees F.
Use a 1/4 cup ice cream scoop to drop dough balls onto a baking sheet, spacing them about 2 inches apart. Flatten each ball slightly with the palm of your hand. Bake for 14-18 minutes, or until the cookies are golden brown on the edges and pale and slightly soft in the center. Let cool on the baking sheet on a wire rack for 5-8 minutes, then transfer to the rack to cool completely. 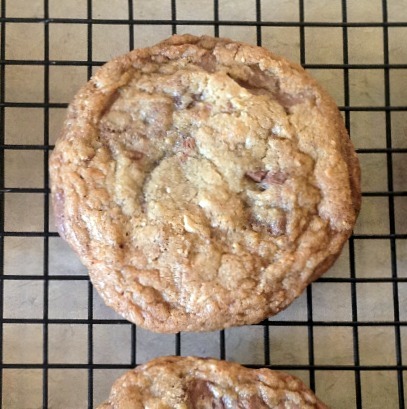 The cookies can be stored in an airtight container at room temperature for up to 3 days. The unbaked dough can be stored in an airtight container in the refrigerator for up to 1 week (the best part about this is that you can bake yourself a fresh cookie whenever the mood strikes). I’m not a fan of cookie dough either but I AM a fan of your ode to cookies. And the recipe looks amazing! these look wonderful. also love that you made them into ice cream sandwiches! I’ve actually never in my life been a fan of cookie dough. I have no interest in even tasting a tiny bit. Thankfully if I am baking with other people around, they are more than willing to taste test. oh.my.gosh. these sound phenomenal!! i was never into cookie dough as a kid, but now… well, i wish i still wasn’t ;) love the ice cream sandwiches, too! These look fantastic! Crispy on the edges, golden in the middle. Cookies are definitely a universal language, understood by nearly anyone and everyone – whether you like raw dough (like I do!) or not. 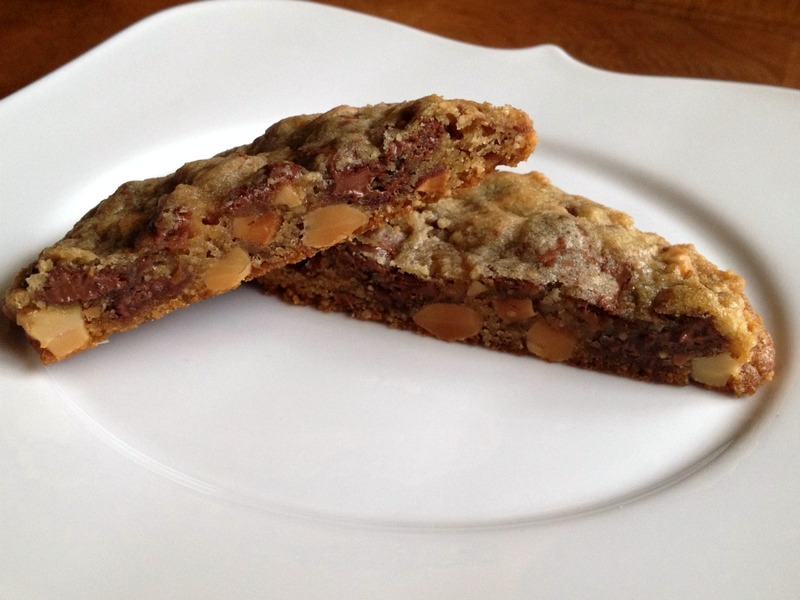 I’m a big almond fan so I love your addition of almonds here – beautiful! Just discovered your blog via Vanilla Bean Blog – and loving it already! While I do like the occasional mouthful of cookie dough or scoop of cookies & cream ice cream, I’m totally with you – the real joy is the transformation they undergo in the oven when they become all crisp and chewy and melty and delicious. These cookies look absolutely perfect. Love! I love the story you shared at the beginning of this post. 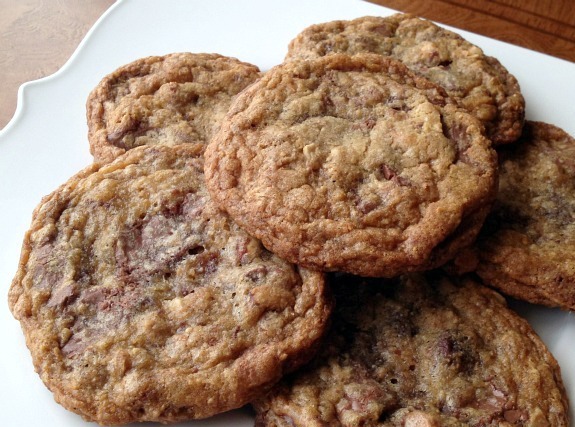 I like fresh baked cookies more than cookie dough but I’m not one to turn down a scoop ;) And I love chewy and chocolate-y cookies – yours look insanely delicious! These look really good. I love your ice cream sandwiches, too.